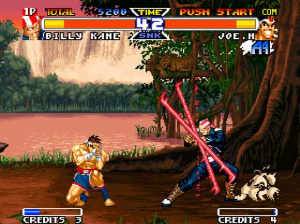 Generally speaking, the "special" SNK releases are generally used as an upgrade to iron out kinks found in the previous releases of the game. 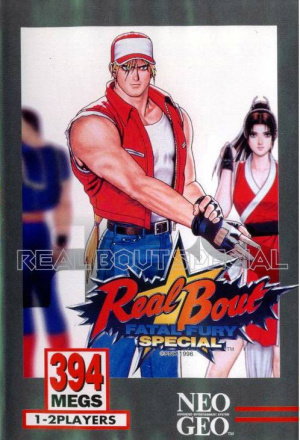 Real Bout Fatal Fury Special is no exception and actually goes quite a long way at upgrading the previous Real Bout Fatal Fury title, even tossing in a bunch of new goodies for fighting game fans to sink their teeth into. Now SNK has released the brawler on the Virtual Console, and it may very well be the best of the Neo fighting titles currently available. Over the course of the series, Fatal Fury has featured fairly gradual improvements to its gameplay system, but SNK really made some nice upgrades when it put this title together; it gave this entry one of the smoothest and most responsive 'feels' the series had featured up to that point. 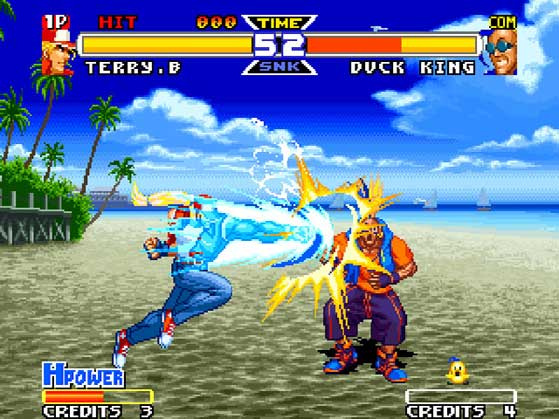 Most fighting aspects of the series return, but Real Bout Fatal Fury Special kicks the speed and combo system up a few notches to make the game a more intense experience. The ability to slide into and out of the background gives it far more defensive prowess than most 2D fighting games of the time period, and when you combine that with the wealth of counters and special moves, you've got a lot of firepower at your disposal. All of the original characters from the first Real Bout release return and SNK was also thoughtful enough to toss in a few new fighters to mix things up a bit. Play controls remain simple, with a punch, kick, and hard attack at your disposal, but you'll soon find the need to put together combos, which is the part of the fighting action that will require some time and practice. While this system might, at first, seem a bit simplistic, it doesn't take long to see how the speedy and responsive player package comes together to give the game a serious selection of strategy, from both an offensive and defensive standpoint. New tunes abound in this title and once again they're a solid blend of rock and synthesizer, along with a nice array of region-specific tracks to lend a little authenticity to the scenery. The characters all got impressive visual upgrades, complete with a much smoother look and silkier animations. And when coupled with the increased speed of the action, it makes for a rather significant graphical update over the original. There's no denying that Real Bout Fatal Fury Special is one smooth one on one fighter. 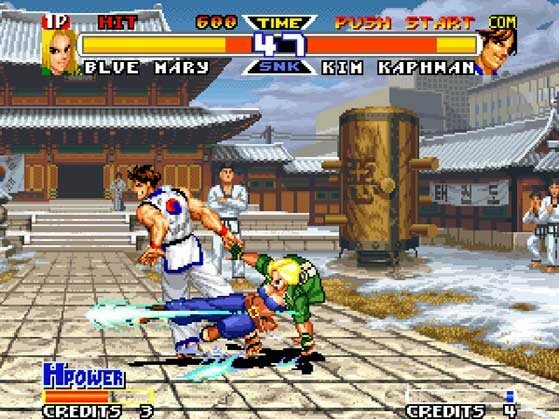 And barring a release of Garou: Mark of the Wolves, it will likely be some time before SNK releases a better fighting game on the Wii Virtual Console. If you like your brawlers fast, furious, and hip deep in combos and defensive moves, you're gonna love this intense and rather well-rounded SNK fighter. I really love this entry in the series. Some really crazy win quotes too! yup, really liked this one. Mad hard at times, though. Wait a sec, have RBFF 1 & 2 been released yet? I think RB2 would be released before MotW. I own RB2 (on NeoCD) and was looking to get the FF collections on PS2, but I may get this one. Edit: calling this just an "upgrade" to RB1 is doing this game a disservice. RB1 used a 3-plane system, while RBS uses the older 2-plane system. Just fyi. I did not really get into Fatal Fury 3 but the Real Bout games are great. They did not release Real Bout, and I was really looking forward to that one. And you are right, this game is pretty different to Real Bout, whether it is graphics, the two lane system and there is even a hidden character (nightmare Geese) if you are good enough to unlock him. There are even alternate versions of some others like Blue Mary or Andy Bogard. And the announcer just talks and talks and talks. Still happy to see this for Wii. This is one of the better SNK fighting game out for the Neo Geo. I love this game, bought it on the day it came out on the VC. Any news on when coming to UK? Been waiting for this one for years but now Last Blade and this have been released in the States with no sign of a release here yet. Well, hopefully they do what they did with KoF 96 and release RB1 later. @Corbs "There's no denying that Real Bout Fatal Fury Special is one smooth one on one fighter." I am not sure what you mean but that sentence. This is my favorite Fatal Fury game. I love the graphics, the backgrounds, and Mai looks so good in this game. I really like how they combined her FF3 outfit with her KOF outfit. @motang My guess is that it plays smoothly? Because it does. The animations and moves are much slicker and easier to pull off. 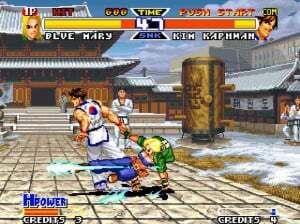 hope that SNK releases the final fatal fury instalment, garou: mark of the wolves. 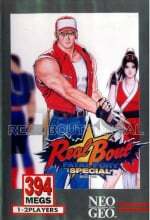 it is considered by many fighting game fans as the pinnacle of the fatal fury series. but real bout is still a really good fighting game and definitely one to download if you love fighting games. @madgear The last blade came out in Europe on 2nd August. @FonistofCruxis You're right, I actually noticed earlier today when I logged onto the Wii shop channel for the first time in months. Guess I missed it as only ever noticed the US news on here. Well that give me more hope this'll be arriving here soon. Keep me posted, please, Nintendolife. Drat, if I had known about this, I wouldn't have wasted my money on regular Fatal Fury Special. I think that I need to buy this game, I want to play The NEO-GEO some day.